Following Up On Forum Discussion: Which Memory Vendor Leads Overclocking? Digitimes’ press release we relayed last week to the community has sparked an interesting discussion amongst some of the forum members. The debate mains revolves around the word “leading” Digitimes uses to describe G.SKILL’s position in the world of overclocking. Is it appropriate to use this word, or yet another term used by marketers to make things sound better than they really are? 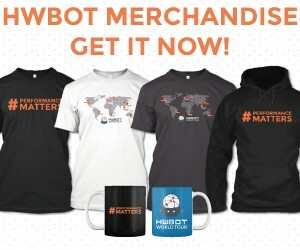 A couple community members asked our Project Manager to run a couple of queries on the HWBOT database to (dis)prove the statement. The data turns out to paint quite an interesting picture. In this week’s editorial we present you the numbers and figures from the database so you can make your mind up about who is leading the world of DRAM overclocking. Enjoy! 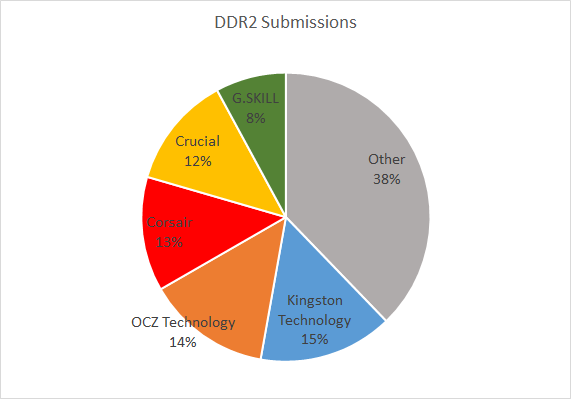 At HWBOT, Corsair was the clear winner of the DDR1 era with 29% of the submissions using their memory. On second place we find OCZ Technology, which is no longer producing DRAM memory, and Kingston. For DDR2 things slightly shifted. Corsair’s share decreased by 16 points while other brands rose up to challenge the market leaders. We of course remember Crucial for their legendary Micron D9 series and rising star G.SKILL. 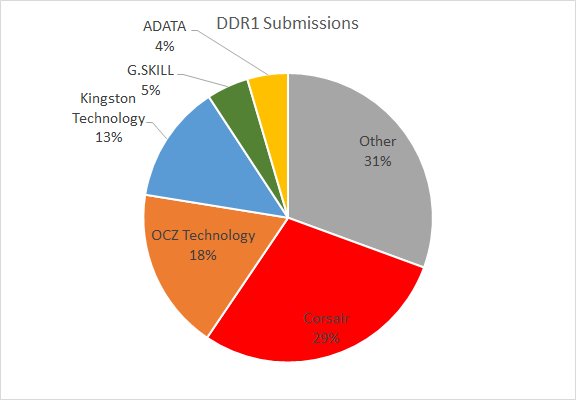 Kingston, Corsair and OCZ Technology share had about an equal share of results. 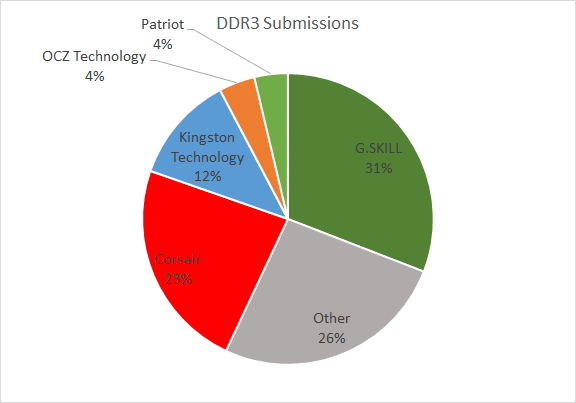 For DDR3, things continued to shift in favor of G.SKILL which now powers the majority of the submissions at HWBOT. Corsair is still second, Kingston following in third place. In the end, it’s all about the overclocking capabilities though. Having a large user base does not necessarily mean you also “lead” the overclocking world, or that you have the fastest and most overclockable products out there. For memory overclocking records in particular, there is usually a fair amount of intense binning involved to find the best ICs. We queried the database to find which manufacturer has the most submissions in the top-100 best Memory Clock validations and were presented with the following table. According to this, it seems that the lines are slightly blurry in terms of who has the fastest kits or best binning procedures. HyperX and G.SKILL are one submission away from each other. This means that the coming months will be interesting as we will see these two brands battle for who can deliver the best and faster memory for overclocking. There is a distinct difference between memory kits used for validation records and memory used to set benchmark records. 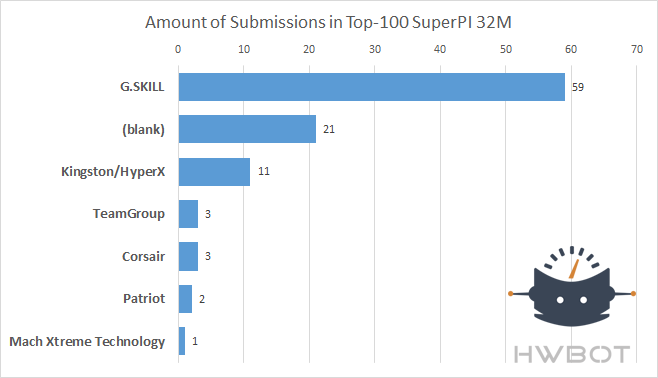 This is exactly what forum members pointed out, and why they asked us to look up the spread for the top-100 SuperPI 32M submissions. So we looked up which memory brands were used for setting the top SuperPI 32M scores! In this case we see G.SKILL topping the charts with 59 out of 100 submissions. As we made clear in the opening lines of the editorial, we are not trying to point out the winner but simply relaying some of the data we also posted in the forum. Looking at the facts, it is quite clear that calling G.SKILL a “leader” in memory overclocking is not a completely unfounded statement. At least for DDR3 they seem to be the most popular amongst the HWBOT crowd both in terms of overall usage and in the top-100 SuperPI 32M ranking. Corsair and Kingston/HyperX are the primary contenders and both very actively involved with overclocking too. My conclusion would be that this shows how fierce and dynamic the DRAM OC market is. I’m truly looking forward to how each company is going to position itself in the near future. What are your thoughts? Let us know in the forum!